Credit: From the Thomson-Walker Collection of the Ontario Heritage Trust. 17th-century trade axe. This axe forms part of the collection of artifacts from the Thomson-Walker archaeological site in former Huron-Wendat territory near Coldwater, Ontario. 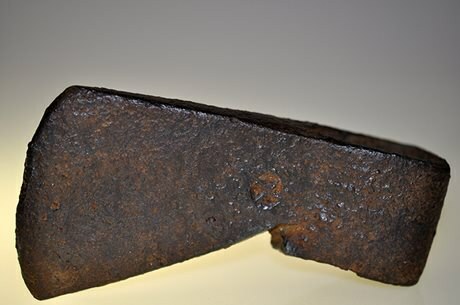 It dates to approximately 1640 and contains the mark of the French blacksmith who manufactured it. Items such as this were used in trade between Jesuit missionaries and First Nations, but were also acquired through extensive trade networks between First Nations.